JRSP President, Hamasaki attended 2nd Japan-Russia Forum （ daily newspaper, Russia sponsored by the Ministry of Foreign Affairs, Ministry of economy, trade and industry other sponsorship ）, held in 2014 years 9 months 8-10 days, Moscow International Trade Centre. Expanded agenda based on timely on bilateral cooperation in various fields to cultural exchanges, science and technology, from energy, healthcare, and business. 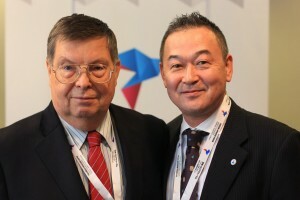 ※Photo’s talks after Yevgeny and afanasyev Russia federal Ambassador to Japan and Hamasaki JRSP President.